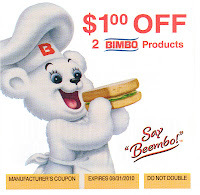 The sticky-note coupon on the front of this morning's Boston Globe got my attention: "$1.00 Off 2 Bimbo Products," it promised. It sounds like something Hugh Hefner might be hawking, but instead of a bunny, the artwork showed a fluffy white bear, chef-hatted and cheerful, about to attack a sandwich. And below was the pronunciation key: "Say 'Beembo!'" Say what? Well, the answer was easy enough to find. 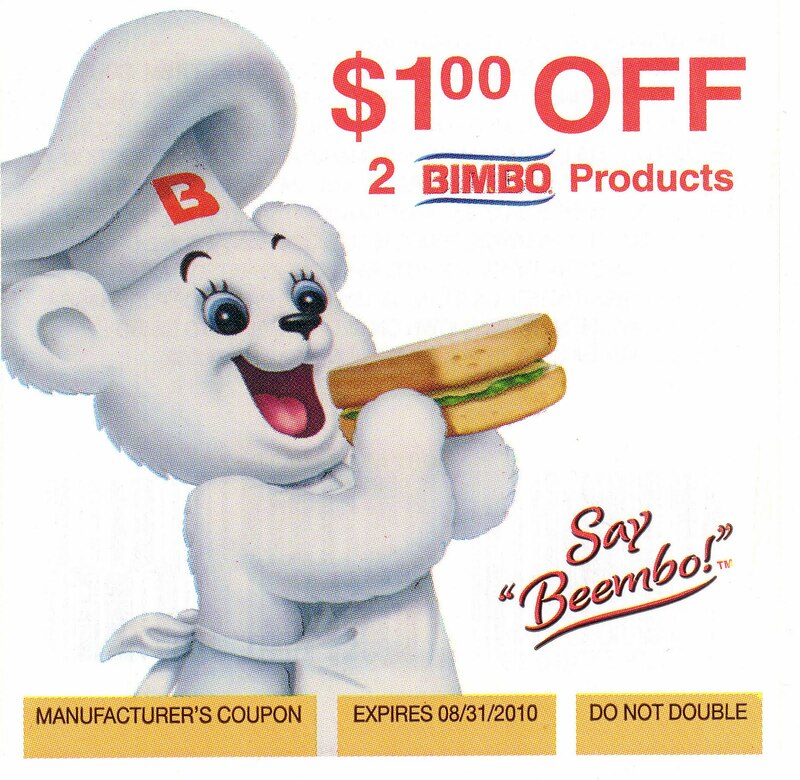 Bimbo Bakeries, a company founded in Mexico, is not only expanding in the US market but owns many old familiar brands, including Entenmann's, Thomas's, and Oroweat. According to Wikipedia, "Bimbo Bakeries USA is the American corporate arm of Mexico's Grupo Bimbo. It is the largest bakery company in the United States, owning six of the top twelve fresh bread brands in the United States." And about the name: "The official version has it that the name Bimbo, coined in 1945 ... was chosen because the company thought it competed well with the existing Bambi and Dumbo brands in Mexico. In addition, the innocent, childlike name went well with the brand image they wanted to build." The OED lists bimbo as equivalent to the Italian bambino, "child." It has cites for bimbo as a contemptuous word for "fellow" from 1919 to 1947 (in P.G. Wodehouse); for "a woman; esp. a whore" from 1929 to 1952; and for an attractive but dumb young woman ("now the usual sense") from 1927. So, "say Beembo" … will that tagline help us all suppress the snicker reflex? Well, apparently our friends in the Southwest and West have been getting acquainted with Bimbo for a while now. Yeah, I know, the first time you hear it, you can't believe it will survive; the cupcake-honey bun jokes write themselves. But if you think you'll be smirking forever, I have two words for you, both hilarious not so long ago. One is Wii; the other is iPad. In the run-up (sorry) to today's Boston Marathon, Lou Falcone has been surprised to find that a number of people don't know that a marathon is not just a long footrace but a specific length, 26 miles and change. He's been congratulated on finishing a "marathon" when it was a half-marathon or less, he says, and friends have been asked, "How long was your marathon?" He wonders: "Has the throwing around of the word 'marathon' in such ways as 'marathon session of Congress' or 'marathon game between the Red Sox-Yankees' so confused everybody that they no longer know what length a marathon really is?" I too am surprised that anyone living near Boston -- where the marathon is literally a traffic-stopping event -- could remain impervious to the fact that a marathon comes in one size only. But I don't think we should rush to blame such ignorance on the non-literal uses of marathon. True, the marathon is named for the Greek town from which, according to legend, Pheidippides made his heroic run to Athens. But marathon wasn't applied to the race until the first modern marathon, in 1896, says the OED. And almost immediately, the word was also used for any "long-distance race, competition, or event calling for endurance, esp. one undertaken in order to raise money or publicize a cause": a 1908 citation records "The Murphy Marathon," a potato-peeling contest. And by 1915, a marathon might be any taxing and (subjectively) lengthy endeavor. Since marathon had acquired its extended meanings even before the race's length was formally standardized in the 1920s, it's not really fair to accuse people of "throwing around" the word, as if its looser senses were modern corruptions instead of standard-issue metaphors. And I'm not even convinced that the non-technical senses of marathon have any connection with people's ignorance of the race's measure. Isn't it more likely that they just don't care enough about the sport to have noticed? Paul Berg writes: "In today's Globe, writing about the Bhutto assassination investigation, Associated Press writer Chris Brummitt offers the following: 'Lack of political will and fear of upsetting powerful vested interests will probably scupper any efforts to find Benazir Bhutto’s assassins.'" Didn't the writer mean "scuttle"? he asks, citing Merriam-Webster's Online Dictionary. There scupper is defined as "an opening cut through the bulwarks of a ship so that water falling on deck may flow overboard" while scuttle means "sink or attempt to sink [a ship] by making holes through the bottom" and also "destroy, wreck or scrap." Under scupper the verb, however, M-W does give the sense "do in" -- a sense that's way more common in British English than American. (And yes, Chris Brummitt -- judging by his appearance on "The PBS NewsHour" -- speaks British English.) A Nexis news search returns just three uses of scupper in the past month in US newspapers and wires, versus roughly 400 in UK publications. Scupper has somewhat murky origins, it's true. The OED's first sense for the verb is "To surprise and massacre," a usage labeled military slang and dating to 1885. The meaning "defeat, ruin" shows up by 1918, but the first guess at etymology comes only later, with the 1993 additions to the dictionary: "The connection [to the noun scupper] is perh[aps] explained by Fraser & Gibbons Soldier & Sailor Words (1925)," which noted that "A man killed in action or falling in heavy weather would naturally roll into the scuppers." The 1993 additions also include a new definition of scupper, dated to the 1970s: "To sink (a vessel) deliberately; = SCUTTLE ... (with which it is sometimes confused)." So in the OED's view, "scupper a ship" is a (fairly recent) mistake for "scuttle a ship." But "their plans were scuppered" is standard usage, nearly a century old. I'm going to nominate scupper vs. scuttle for Lynneguist's "Difference of the day." Thanks for the tip, Paul! Yesterday's Word column mentioned a dispute over whether the word hick was American or British in origin, a squabble summarized in a footnote from H.L. Mencken's "The American Language" (1921 edition). Mencken reported that hick was shown to be "actually perfectly sound English [that] could be found in Steele’s comedy, 'The Funeral'" . So far, so good. But the footnote continued: "Two weeks later, a Norwegian philologist, S. N. Baral, followed with a letter showing that hick was connected with the Anglo-Saxon haeg, indicating a menial or lout, and that it had cognates in all the ancient Teutonic languages, and even in Sanskrit!" Well, maybe not. The OED says hick is "A familiar by-form of the personal name Richard." It is indeed British in origin; the earliest cite is dated 1565, and in a pre-1700 dictionary hick is defined as "any Person of whom any Prey can be made ...; also a silly Country Fellow." We have seen how, even so early as Webster’s time, the intransigent Loyalists of what Schele de Vere calls “Boston and the Boston dependencies” imitated the latest English fashions in pronunciation, and how this imitation continues to our own day. New York is but little behind. ... The small stores in the vicinity of Fifth avenue, for some years past, have all been turning themselves into shops. Why ... should we shut ourselves off from the good things in words that have been invented or popularized in Great Britain since the Pilgrims sailed? And why, on the other hand, should the Englishman disdain the ingenious locutions that have come to light on this side the Atlantic? Let him who says naturally a pail of water say so still, and him to whom a bucket is more familiar rejoice in his locution. Let my English friend call for his jug, while I demand my pitcher; for he will -- if he be not afflicted with logophobia -- enjoy what seems to him the fine archaic flavor of my word. I'll drink to that -- from either pitcher or jug. Wisconsinites are also on the mavens' route; Mr. Verb has been spreading the news that Dan Everett, known for his years studying the Piraha language and culture, will be in Milwaukee on Tuesday, speaking on "Cognitive Fire: Language as Cultural Tool" at Marquette University. Here's hoping someone will record both Pullum and Everett for our YouTube watching pleasure. Reader Paul Berg wrote some weeks back to complain about a TV ad for a stop-smoking drug called Chantix. "During the commercial, the voice-over announcer proclaims: '40% of Chantix users were quit after 20 weeks' -- or words to that effect," he wrote. "'Were quit'? This drives me nuts!" I'd never seen the commercial, but I dug one up, and the actual voiceover says, "44 percent of Chantix users were quit during weeks 9 to 12 of treatment, compared to 18 percent on sugar pill." Not normal English, I agree. Not because "were quit" is incorrect -- you'll run across it often in Brit lit -- but the idiom is 'be quit of [i.e., finished with] something." The OED's examples span the years from c. 1200 to 1997, and include one from Jane Austen: "They ... seemed to think it as great an escape to be quit of the intrusion of Charles Maddox." But "be quit of" doesn't work when the subject is smoking (unless you want to say, "At last I am quit of that nasty habit"). So why use it? Well, "44 percent had quit" would suggest to many listeners that those smokers had quit forever, not just stopped for weeks 9 to 12 -- something very unlikely to be true. "Forty-four percent were not smoking" would be standard English, but it lacks the victorious ring of "were quit." I don't know if "were quit" is researchers' jargon or just marketers' bafflegab, but I strongly suspect that it's meant to gloss over the question of how many people on Chantix "stayed quit" in weeks 13 and up. Over at Headsup: the Blog, fev wants to hear how we feel about the journalistic fetish that insists on "more than" instead of "over" when referring to numbers: "The operation took more than [never over!] six hours." I looked into the issue while researching "Write It Right," since it was (naturally) one of Ambrose Bierce's nits. Typically, Bierce didn't bother to state an objection; he merely banned "Over for More than," as in "A sum of over ten thousand dollars." "There were not over twenty persons present:" say, more than. Such a use of this word is not frequent among writers of reputation. It may, however, be less improperly employed, where the sense invests it with more of a semblance to its literal signification: as, "This pair of chickens will weigh over seven pounds." Even in this case, it is better to say more than. Who was Walton Burgess? According to a New York Times obituary, he had worked for his father’s publishing business in New York City, then started his own. He “dropped dead of paralysis” in his office, aged 57, in December 1890. Since "Five Hundred Mistakes" was published by Daniel Burgess & Co., it sounds like the same W.B., but I found no clues to where he learned the "over" rule. Not everyone subscribed to the rule, of course. In 1848, Seth T. Hurd used "over" in the forbidden way in his own "Grammatical Corrector, or, Vocabulary of the Common Errors of Speech," objecting to "A LONG MILE, for a little over, or a little more than a mile." And in 1900, Scott and Denney's "Elementary English Composition" said of "The buildings cost over a million dollars" simply: "This use is correct." The OED shows "over" used with numbers since Old English. The "over/more than" thing is an invention of American journalism, unknown and unloved outside that shrinking cabal. In "Write It Right," I said that maybe only the death of newspapers would kill off this parasitic superstition; I hope that was just hyperbole. Because they perform better on empty stomachs? No, the headline means "don't feed children bad spelling," i.e., don't expose them to its corrupting influence -- still not quite idiomatic in my dialect, but if you omit that ambiguous "with," it's a little easier to grasp the sense. This one, apparently composed here for a story picked up from the Tanzania Daily News, was more mysterious -- the headline's "pasture" appears nowhere in the lengthy text. But at the very end, we find the detail that must have inspired the headline writer: Tanzanians, says one teacher, aren't learning English well enough to qualify for jobs in neighboring East African countries -- greener pastures, at least metaphorically.